Film-Arcade.net: New Images for the Upcoming Crime Comedy "Masterminds"
New Images for the Upcoming Crime Comedy "Masterminds"
Relativity Studios recently released the official trailer and stills for Jared Hess' (Napoleon Dynamite; Nacho Libre) long delayed film "Masterminds". The film stars Zach Galifianakis, Owen Wilson, Kristen Wiig and Jason Sudeikis. 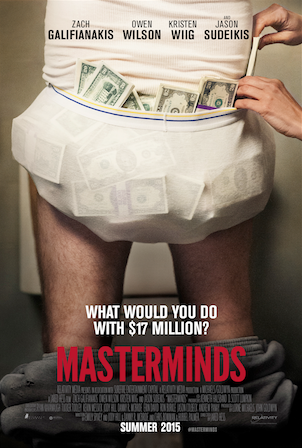 "Masterminds" hits theaters on September 30th. Along with a group of half-brained criminals led by Steve Chambers (Owen Wilson) and an absurdly faulted heist plan, David manages the impossible and makes off with $17 million in cash...only problem is he foolishly hands the money over to this wild group of double crossers and has been set up to take the fall. With the bandits blowing the millions on lavish and ridiculous luxuries, they leave behind a glaring trail of evidence. Now on the lam and in over his head, David must dodge the authorities, evade a hilarious hit man, Mike McKinney (Jason Sudeikis), and try to turn the tables on the ones he trusted most.